Finding meaning in life is an age-old quest that has perplexed people across geographical frontiers and transcended religious and spiritual affiliations. It attracts the interest of sages, religious scholars, and ordinary individuals alike. From distinctions between faith traditions to individual differences within a single religion to variances in time and space, every person will answer this question their own way, uniquely. It is therefore a quintessentially individual and personal search involving a diversity of perspectives. As a Hindu, for instance, my definition of a meaningful life may be quite divergent from a person brought up in the Jewish tradition and at the same time different from other Hindus. Although my belief in certain underlying concepts of Hinduism, held in common with other Hindus, certainly shapes my views on life, it is not the sole source of meaning for me. My perspective is heavily influenced by my individual experiences, the various social and cultural realities that exist around me, including where I live, my family background, and my sense of identity. That said, for me attaching meaning to life does indeed start with the Hindu idea of moksha, or liberation from samsara, the cycle of birth, death, and rebirth, with the ultimate goal of uniting my soul with the divine reality (God). Consequently, I view life as part of a larger spiritual journey and not an end in itself. And since this journey to moksha likely takes several lifetimes to accomplish, I view this life and every potentially subsequent life as an opportunity to make spiritual progress towards that final objective. How does this translate into the decisions or actions I take on a regular basis? In other words, how does the concept of moksha relate to me on a micro level, allowing me to find meaning in the commonplace events, experiences, and circumstances that define my life? Admittedly, I am not one to read and study scriptures, do yoga or meditation on a regular basis, or consistently participate in devotional activities and daily rituals. 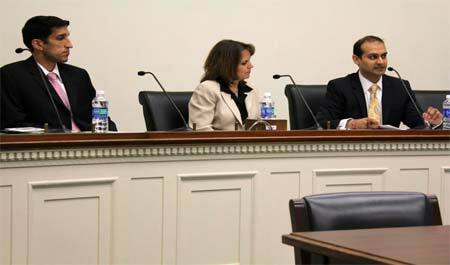 Samir Kalra, on the right, testifying in Washington, D.C. on the plight of Hindus in Kashmir. Nonetheless I have absorbed the teachings and precepts of Hinduism and tried to apply them to my everyday life. In particular, the concept of karma yoga has always held great appeal for me, inspiring my pursuit of public interest work and human rights advocacy. Loosely defined, karma yoga is selfless action or service on behalf of others, free of attachments or self-centered desires. It represents one of many valid paths in Hinduism in reaching the divine or achieving moksha. In terms of my legal background, for example, the desire to follow a path of karma yoga impacted my decisions starting as early as law school. Given the choice of a variety of internships, I chose to work at free legal clinics serving low-income populations. This eventually evolved into a career as a public interest attorney, where I had the opportunity to represent mentally and physically disabled clients unable to afford legal services. Rather than a private legal practice or working at a law firm, I felt a career in public interest law would bring greater meaning to my life, as it was in pursuit of the ideal of selfless action. Similarly, with a transition to human rights advocacy, where I now work on behalf of voiceless and oppressed Hindu minorities throughout the world, I continue to strive for personal spiritual growth. In 1947, when British colonial rule in India ended, the subcontinent was cut in two - a secular India with a majority of Hindus, and Pakistan, predominantly Muslim. Unfortunately, the division resulted in widespread violence and tragedy for millions of Hindus, Muslims, and Sikhs. My father, like so many others, found himself on the wrong side of the newly created border, and our family was forced to flee our ancestral homes in what became Pakistan. These events had a powerful impact on me and influenced my decision to become a human rights advocate. These career choices have frequently forced me to confront a level of inequality and injustice that is incomprehensible, enough to challenge my basic conceptions of a meaningful life. From systemic barriers that operate consistently to marginalize low-income Americans – to an international community that routinely ignores the plight of persecuted Hindu minorities, it is difficult to accept the demoralizing realities. But it is exactly in these situations where my belief in moksha and karma yoga help me maintain a larger perspective and remain focused through periods of darkness. They also serve as a reminder not to obsess or ruminate over the small, inconsequential things in life and to persist in my individual duties. It would be difficult for me to find meaning in life without the ability to rely on some type of overarching framework, whether it is grounded in religion, spirituality, or on some other basis. For me, that framework is Hinduism, and more specifically the timeless principles of moksha and karma yoga. These are the sources that provide meaning to my life within my current social and cultural environment, and subtly guide my actions and behavior towards my ultimate goal.